And for the Paris to London leg he's being joined by several of my chums from the Greene King brewery of Bury St Edmunds, which he helps to promote. I know this thanks to GK's generous sponsorship of the London Bloggers Meetup last week, a fine monthly institution where you can meet other bloggers face to face and have a lot of free drinks. If you write a blog, I heartily recommend it. 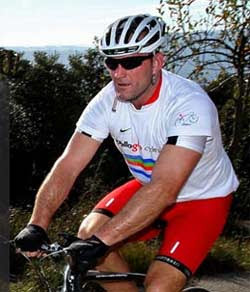 What caught my eye about Dallaglio's ride is not the charity aspect, but the premise. Cycle touring is one of the three things that make life worth living, though I've forgotten what the other two used to be. And for me, the perfect cycle tour has some sort of semi-arbitrary premise. Because the best things from a tour come from the getting there: the unpredictable encounters and spontaneous experiences en route. But without the end, you never get the means. And Doing All Six Nations Stadiums seems a fine excuse for a long bike ride to me, though I'd've taken about five times as long to enjoy it properly. 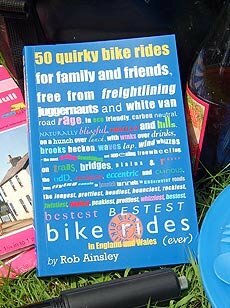 But here's some more, genuine, cycle-tour wheezes I've done or heard about. It's the premise, you see, that turns a Cycling Tour into a Real Cycling Tour. Land's End to John O'Groats Of course lots of people do this. But better with a theme. When I did it I had only local food en route: fish in Padstow, cheddar in Cheddar, pork pies in Melton Mowbray, stotties in Newcastle etc. I met other End to Enders who linked cathedral cities; or who stayed, ate and drank only at pubs called the Red Lion. Britain side to side There are lots of coast-to-coast routes now (Sea to Sea, Reivers, Hadrian's Wall etc). 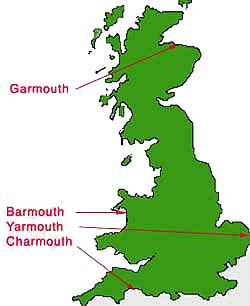 But one I particularly like is the sonorous and alphabetically satisfying Barmouth to Yarmouth. Some people even take in Charmouth. A to B One chap cycled from A, in Norway, to Bee, in Nebraska. A splendidly pointless point-to-point. The Old Iron Curtain Fascinating trip some guy did last year along the old border. The pre-1989 Road Atlas of Europe used to scare me. All of civilised Europe was full of towns and roads and green bits to denote forests and mountains, but beyond the iron curtain it was a vast featureless expanse of white, with just a few straggly roads and grim towns like Minsk and Gdansk. Then the wall came down and you could cycle there, and you found it wasn't all white, in fact it looked rather like where you'd just been only a bit shabbier and with much cheaper beer and quite nice people. Scottish Football Grounds In preparation. A journey of discovery, trying to find 'places' such as Raith or St Mirren. Alphabet Soup Another plan in progress. A 26-day cycle trip that involves staying at a place beginning with each letter of the alphabet in succession. X could be a problem. Today's trip Links Tesco, the Turkish grocery, East St market and a theatre in Greenwich. I'm raising money for a round tonight. 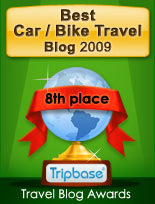 I was thinking of places cyclable in a day from, say, Elephant and Castle. There might be a Xian restaurant, I suppose. Indian Taj Hahal to Turkish Boğaziçi should be possible? They're both in Streatham (or were). I thought you might be interested in Cycle East, as part of EAST Festival 2010. Cycle East will take people on a tour of East London venues by bike on Sunday 7 March, offering the chance to listen to free music. I was thinking of doing JOGLE as an alphabet soup, the best X I could come up with was Exemouth, which fitted rather nicely with the town of Zennor, just a few km from Land's End. @Monica... I partook in the East Festival 2009, being corralled into performing in Kagel's street-theatre piece for 111 bikes, and blogged about it. And I still have the T-shirt. Thanks. @Greg... Yes, that's about the only practical X, isn't it? The only place name I can think of in the UK with a capital X in it is Ruyton-XI-Towns near Shrewsbury, which doesn't really fit the bill.